Photo: Len Wood EDC representative Alicia Roessler speaks to the Planning Commission. Over the past 28 years, Linda Krop and Andy Caldwell have butted heads so many times they should have sprouted calluses on their respective foreheads, Krop as chief counsel for the Environmental Defense Center (EDC) and Caldwell as spokesperson for the Coalition of Labor, Agriculture & Business (COLAB.) Last week’s showdown over a proposal to vastly expand onshore oil production just outside Santa Maria brought the two antagonists together again, only this time the argument was framed in global terms. Krop highlighted the 250,000 metric tons of greenhouse gases that are projected to be generated a year by oil company ERG if its production expansion plans in Cat Canyon are approved. That’s dramatically more than what ERG has been generating from its existing operations there. If all the additional oil produced by ERG were to be consumed, project opponents contend, that would add another 1.8 billion metric tons to the atmospheric stew over the next 40 years. Speaking extemporaneously, Caldwell dismissed such exhortations as so much “virtue signaling.” If Santa Barbarans did everything within their power to reduce greenhouse-gas emissions, it would make little difference in the global scheme of things, he said. “China’s building a new coal power plant every single week,” he said. 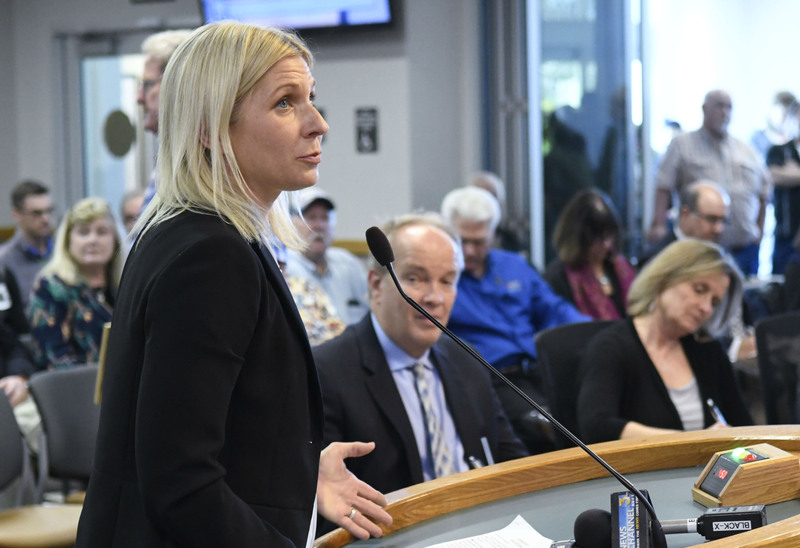 “When it comes to greenhouse gases, we don’t matter.” What does matter, Caldwell argued, are jobs, especially the relatively high-paying jobs ERG would generate if its proposal were ultimately approved. “Oil is what we do,” he said. “It’s what we are.” If approved, ERG’s expansion plans ​— ​which call for the drilling of 187 new wells ​— ​would generate roughly 115 jobs, of which 14 would be permanent and full-time. Krop and Caldwell made their remarks during a five-hour hearing held March 13 to determine whether the environmental impact report (EIR) for the proposal met the legal threshold of being “adequate,” meaning the document accurately described the project, its environmental consequences, its mitigations, and its alternatives. ERG’s is the first of three major oil proposals slated for Cat Canyon ​— ​all relying on various permutations of steam injection technology to extract thick, hard-to-get crude from 3,000 feet underground. Combined, these three projects would generate up to 750,000 metric tons of greenhouse gases (GHGs)annually. With climate change having achieved new traction as a local concern in the wake of the Thomas Fire, environmental opposition is intense. Krop, EDC, the Sierra Club, and a broader coalition of environmental activists are objecting the EIR is inadequate, citing a blizzard of issues. Chief among them, however, is the lack of specifics as to air-quality offsets that ERG proposed to acquire to mitigate the GHG emissions down to nothing as the company has pledged. (Typically, such offsets can be purchased on the state’s cap-and-trade market.) According to county energy planners, that level of detail is typically not required until after the EIR and the project itself have been approved. Krop insists otherwise and cites a couple of court cases she says support her contention. How the Planning Commission will navigate this issue remains to be seen. Public testimony totally consumed last week’s hearing, leaving the planning commissioners no time to ask questions, weigh in, or even vote. It’s anticipated that at least one more hearing ​— ​and possibly two ​— ​will be needed before the Planning Commission renders its verdict as to the adequacy of the EIR and on the proposal itself. Whatever the outcome, the results will all but certainly be appealed to the Board of Supervisors later this year. The subhead to this story was corrected from 8,000 percent to 800 percent on March 22, 2019.